This past Sunday I traveled, with my father, to a church in rural Nebraska where Dad preached on the appointed Gospel reading. The topic was the story of the 10 lepers and the sermon was a carefully revised and updated version of one of his father’s sermons. It was a joy to sit in the front pew and learn from God as he worked through my father and grandfather, a beautiful message and a touching legacy. I was reminded of one of my favorite teaching stories. 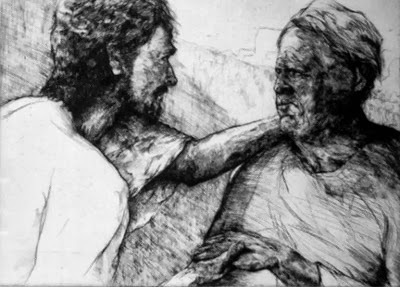 I had a mother of one of my first graders call me to relate that her son was convinced that I, and nine of my friends, had been healed of leprosy and that I was the only one who thanked Jesus. I’d like to think I would remember to thank Jesus, but I know myself better than that. However, I did adjust my Bible story telling procedures for that school year. After I dropped my father off at his home, for a well-deserved nap, I continued home from Seward. My thoughts drifted to a book about leprosy that I read many years ago. It was co-written by Dr. Paul Brand and Philip Yancey and is called Pain: The Gift Nobody Wants. It has since been re-released as The Gift of Pain. I remember pouring over this book, ruminating on it, and finding it changing my outlook on life and my reaction to the events of my life. Dr. Brand spent a lifetime working with people with leprosy. While his life story is very interesting, what stunned me was the basic premise of the book: without pain, we lose everything. When Dr. Brand began his work with Lepers, the medical community assumed that wounds that did not heal and subsequent loss of digits and limbs was a symptom of the disease. What Dr. Brand’s work was able to show was that these occurrences, so prevalent in leprosy patients, were caused, not by the disease, but by the lack of pain. People who do not feel pain in their feet take every step the same way which causes wounds that do not heal because the compromised areas are not favored or protected. Eventually a Leper will destroy a foot, by continuing to walk on a wound. This happens, not because the flesh is bad, but because there is no pain to give warning. The lack of pain can cause the blessing of being able to walk to be destroyed. Pain is good for us. Pain is partly responsible for the blessings we have in our life, not only for our appreciation of those blessings, but also for our being able to keep and enjoy them. Recalling this book made me take a new look at the story of the 10 Lepers. When they discovered they were healed, their hearts would have been filled with indescribable joy. They would no longer be unclean, no longer exiled, no longer a danger to their loved ones. I am sure their heads were as full as their hearts. But, we must remember that the miracle that restored their skin and their health would have also restored their sense of pain. They would have felt every stone as they walked to the temple, felt the sun’s heat on their heads and necks. They would have felt the pain of walking on blisters. Only one Leper returned to offer thanks. Perhaps he was the only one able to say thank you for pain. Pain is a part of our earthly life. We sin, we cause pain, we experience pain. That pain brings us to God, just as our sin brings us to repentance. If we pray for no pain, just as if we prayed for no guilt, the formula would no longer work. There was no need for pain in a perfect, sinless world, but our current world not only causes it, it requires it for survival. I am a wimp about any kind of pain – physical, emotional, or spiritual. I want an easy carefree life. Pain mucks things up and ruins the perfect picture. Pain is a hindrance, a distraction, an annoyance, a grievance. But, pain is a blessing. It makes us stop what we are doing and listen. Pain makes us act. It makes us move. It protects our hands, our feet, our eyes, and our faith. Pain in our feet makes us adjust our step, ever so slightly. Pain in our hands warns us of the danger of what we are touching. Pain in our eyes causes us to blink and tear up. Pain in our soul shows our repentant heart that we need the One who offers forgiveness; that we need the One who offers peace. Today I stood with friends in pain, excruciating pain caused by loss, by anger, by grief, by their love for each other. I wished with a fervent heart that I could take away the pain, or that God would. Instead, I held them up to our Father, in prayer, and I cried with them. Instead, God reminded them that they are His. If we have pain, we are alive. If we have pain, we are hearing from our bodies, our hearts and our faith. If we have pain, we are reminded that we are precious children of a God who loves us and cares for us, even as He forgives us. For I am ready to fall, and my pain is ever before me.